Here are some of my recent publications, guest posts, interviews, photography, podcasts, and speaking engagements. In an open-air auditorium on the outskirts of Antigua, Guatemala, teenagers wearing their finest formal outfits grasped their diplomas as they posed for obligatory photos with proud parents and restless siblings before dashing off for selfies and snacks with friends. Badri Rai is celebrating some good news this month. Nepal’s Department of Immigration just announced that foreign tourist arrivals shot up 28 percent in the first half of 2017 – 460,304 tourists arrived via air in the first six months of 2017, compared to 359,672 in the first half of 2016. Did you ever think of all the ways that volunteering is good for your career? There’s no question that volunteers benefit from volunteering. Bambike Revolution Cycles, a social enterprise based in Manila, Philippines, isn’t your typical bike shop. It rents and sells hand-crafted bamboo bicycles made from sustainable materials that reduce the impact on the planet. This past fall (autumn for those outside North America), I was lured to Palawan, a culturally and ecologically rich archipelago in the Philippines made up of nearly 2,000 islands. If you find yourself at the foothills of the Rocky Mountains in the college town of Boulder, Colorado, chances are you’re going to work up an appetite at some point. Jim Olsen admits that the Green River Festival – named by USA Today, the New York Times and Rolling Stone as one of the best festivals in the U.S. last year – had humble beginnings. In the “Drinking Buddies” series, I ask fellow travel bloggers to share their favorite bar experience from their travels. In today’s edition, Brianne of A Traveling Life gives you the inside scoop on drinking at the edge of the world in Uruguay. Everyone knows that Paris, London and New York are where fashion lovers flock. But if you’ve already strolled through the Tuileries, cruised down the Thames and caught a show on Broadway, don’t worry, there are still plenty of other stylish cities around the world to explore. The U.S. is the only industrialized country in the world that has no legally mandated annual leave – most Americans are lucky if they can squeeze in one week of vacation each year, with a few extra days off scattered here and there (That sounds depressing, I know!). How to Set a Travel Budget and Stick to it | Meet, Plan, Go! Brianne is a Boston-based non-profit consultant and travel blogger with a particular interest in responsible travel. In this Globavore Interview, we hear from Brianne Miers. Hey everyone! This week we’ve got the lovely Brianne! I’m Brianne, and I’m originally from a small town in New Jersey. I’ve been based in Boston, Massachusetts, for about eight years. At Wanderful we’re all about the sisterhood, and we love hearing from our community! That’s why our pro membership is so cool: Wanderful women from all over the world get to access the all the benefits of being Wanderful in awesome ways. 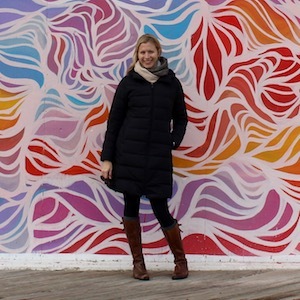 Brianne of A Traveling Life is a very active travel blogger based out of Boston. When she is not planning her own trips she is heading up the Boston chapter of Meet Plan Go, so basically she is in travel mode all the time! In the day and age of social media, it seems as if there is an Instagram account for just about everything. The world is a colourful place, and who better to look to than the MatadorU student body — thousands of travelers…. On this week’s show, Brianne shares some of her worldly experiences, tips on how to practice sustainable travel, and some of her top favorite destinations to go to. When you go away on a longer adventure, coming back home can be tough. Today we discuss the struggles of the re-entry process after a big trip with Brianne Miers.